We also discussed trends around the turn of the 19th Century as they affected San Francisco Bay. The Spanish had a Presidio and a Mission, but no Pueblo. This was an outpost in the farthest outreaches of the now dwindling Spanish Empire. Growing New England trade and whaling was beginning to bring Far East and South Pacific ship traffic to San Francisco Bay. There they could secure subsistence and stores, especially fresh water and wood, for the next long legs of their Pacific voyages. They might also repair their battered ships at the Mission Dolores which bragged of excellent blacksmiths and shipwrights. Sea otters as they may have once appeared in the San Francisco Bay at the beginning of the 19th century. There was one other trend that confounded the Spanish in San Francisco Bay: sea otter hunting. The Spanish were not inured to the Northern Hemisphere and its cold winters that required fur clothing and fashion. On the other hand, the Northern Europeans and Chinese sought sea otter furs for fashionable clothing in winter. In particular, sea otter pelts were highly prized by the Chinese. They brought high prices. The little fury sea creature had the densest fur of any mammal, on land or in the sea. But even though San Francisco Bay was full of the sea otters, the Spanish did not harvest them. The Russians understood sea otter pelts very well. 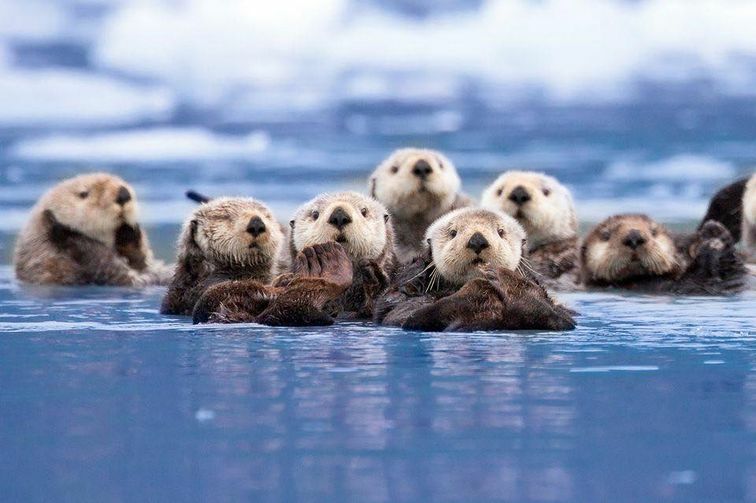 From their vantage point just northwest of Japan in Vladivostok, the Russians harvested the sea otter in its indigenous North Pacific habitat. Caravel technology enabled them to reach across the North Pacific to further this effort. In the early 1800s, the Russians established a settlement of the Russian-American Fur Company in Sitka, Alaska. There they hunted the sea otter along with their Alaskan partners, the Eskimos. They combined the Russian rifle and the Eskimo whale boats to hunt sea otter, eventually almost to extinction. But in the winter of 1805-1806, near starvation and scurvy plagued the Russians at the Sitka colony. They needed to explore further south in search of fresh fruits and vegetables and perhaps more temperate hunting grounds. On March 28, 1806, the Russian-American Fur Company's ship the Juno arrived at the Golden Gate. She was under the command of Count Nikolai Petrovich Rezanov and loaded with trade to secure the subsistence and stores she needed. As the Juno sailed directly into the port, they used Captain Vancouver's charts and descriptions. "[W]e had much satisfaction in proving the correctness of Vancouver's charts and views, which left nothing further to be desired," remarked the ship's German-born physician Georg Heinrich von Langsdorff. As the Juno approached the Castillo de San Joaquin (Fort Point), the Spanish used a megaphone to ask the Juno to identify herself. Satisfied with the response, they directed her to anchor near the Fort. Shortly thereafter, the acting commandant of the Presidio Lt. Don Luis Arguello, Padre Jose de Uris from the Mission and a detachment of soldiers, all on horseback, arrived at the shoreline. They met with the ship's delegation, the physician Langsdorff and a ship's officer, one Lt. Davidov. Langsdorff and Padre Uris conversed in Latin, the only common language among the delegations' members. Once the Spanish understood the Russians were in need of subsistence and stores, they welcomed them. They invited Count Rezanov to come ashore. As the Count did, the entire group went to the Presidio to be officially welcomed. Langsdorff thought that the Presidio had "the look of a German farmstead." The ride from the Juno's anchorage to the Presidio was a little more than 15 minutes. At the Presidio, Lt. Arguello's mother the Senora Arguello provided an "excellent repast" on a "rich service of silver tableware." On the Russians return to the Juno after dinner, they learned that Don Luis had sent a nice package of subsistence just to tide the crew over. That afternoon, Spanish soldiers had delivered "four large fat oxen, two sheep, onions and garlic, lettuce and cabbage, as well as several other kinds of vegetables." As they bedded down for the night, the Russians were quite happy with the reception they had received in San Francisco Bay. One Russian in particular, Count Rezanov, had special dreams. During the day, the Count had met Don Luis' young sister, the captivating Dona Concepcion. The Germans (Bach) and Austrians (Mozart) make music for the brain. But the Russians (Rachmaninov) make romance of music and almost everything else. The young Russian Count Rezanov couldn't get Dona Concepcion out of his head. Her "vivacity and cheerfulness, her love-inspiring and brilliant eyes and exceedingly beautiful teeth, her expressive and pleasing features, shapeliness of figure" and a "thousand other charms" swept Rezanov off his feet. The next day, Don Luis told Rezanov that the Russians would have to enter into a trade agreement with Monterey before the Spanish could fulfill the Juno's need for a major allotment of subsistence and stores for Sitka. It would take a matter of days to work out the agreement. In the meantime, the Spanish would provide daily rations to the Juno and fete the officers as before. Stay in San Francisco Bay? Continue to dine at Senora Arguello's in the lively presence of Dona Conception? This had to be music to Rezanov's ears. Russian music. We'll pick up with the young Count Rezanov and Dona Concepcion next time.